The Alaska Public Offices Commission spent much of Tuesday listening to attorneys on each side of the salmon habitat initiative argue whether the groups supporting the measure are properly following disclosure laws. 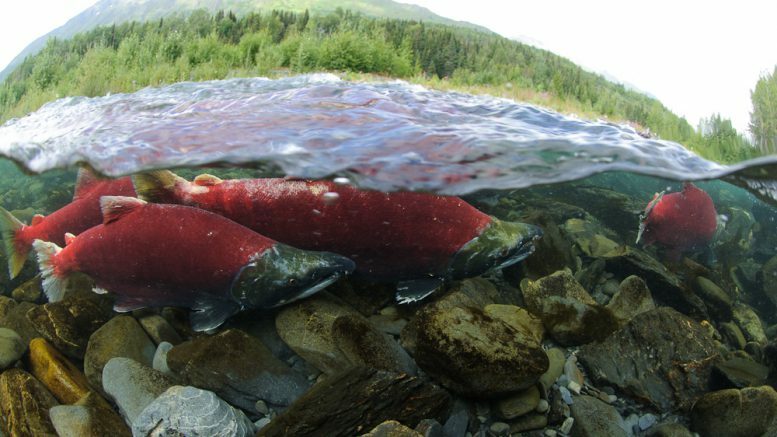 The complaint brought against the three organizations working to support the measure—Yes for Salmon – Vote Yes on One, Stand for Salmon and The Alaska Center—argues the groups have been benefiting from so-called “dark money,” or contributions that can’t be traced back to their original contributors. The complaint was brought by the Stand for Alaska – Vote No on One, a group that’s received more than $11 million mostly from resource development companies and industry groups. The argument and much of the commissioners’ attention Tuesday focused on the involvement of the New Venture Fund, a Washington D.C.-based 501(c)(3) nonprofit, that has put about $200,000 into the campaign by way of non-monetary contributions of staff time, mostly of initiative campaign director Ryan Schryver. The contribution itself was reported as a non-monetary contribution to Yes for Salmon – Vote Yes on One. The question is whether or not New Venture Fund should have to register as its own political organization under Alaska disclosure laws, revealing its donor list to the public. On Monday, the Walker and Mallott campaign filed a complaint against the Republican Governors Association and Families for Alaska’s Future, which is primarily funded by the Republican Governors Association, of multiple campaign violations. The core of their argument is quite similar to the complaints surrounding the salmon initiative, arguing that the Republican Governors Association was directly involved in the campaign and should have to register as a group and reveal its contributors. Both complaints argue that these contributions are hiding something from voters. Perhaps one of the most telling moments of the salmon initiative hearing was an exchange between Stand for Salmon’s Ryan Schryver and APOC commissioner Tim Dietz. Dietz asked how Alaska voters could go about understanding the New Venture Fund. Schryver responded by asking whether the backers of Stand for Alaska should also have to disclose their donors. “My question would be: ‘How does the average voter know where the money is coming from with BP or ConocoPhillips or any of the groups working to fund the other side? '” he said. Perhaps a better comparison would have been the industry groups that have also contributed significant resources to the Stand for Alaska campaign, but the point here, really, is that none of this matters under the current state of Alaska’s disclosure laws. With both cases, campaign law essentially already allows this type of behavior. Independent expenditure campaigns–which can raise and spend freely as long as they don’t coordinate directly with a candidate–can effectively mask contributions by accepting large lump-sum contributions by other groups. Though independent expenditure groups have to disclose the source of every dollar it receives those same rules don’t extend to the groups backing them. The contributions to New Venture Fund and any other non-profit aren’t required to be disclosed under federal laws. The main requirement is that these 501(c)(3) groups can’t get directly or indirectly involved in any candidate race, but they are allowed to advocate and campaign on issues. Stand for Alaska has, as Schryver pointed out, has benefited from this, too. It doesn’t have to ask its backers–like BP, the Alaska Miners Association or the Alaska Oil and Gas Association–to disclose their backers. The complaint against the RGA stands out from this, however, because the Walker and Mallott campaign argues the group didn’t even meet those basic requirements because the RGA itself reserved advertising time–according to filings with the FCC–well before Families for Alaska’s Future was ever formed. The only way for voters to drill into the finances of the New Venture Fund or the Republican Governors Association is if APOC finds they were directly acting as a campaign, thus opening them up to the higher level of reporting required by groups. The complaint with the salmon initiative is expected to get a resolution next week, while the Walker/Mallott complaint against the RGA has yet to be scheduled for a hearing. Be the first to comment on "Who’s paying for what? ‘Dark money’ at heart of pair of campaign finance complaints"